Your messsage has been received. Sign up to receive promotional offers and new product announcements. Watercolor Studio creates fluid, liquidy, translucent watercolors with paint that flows naturally. 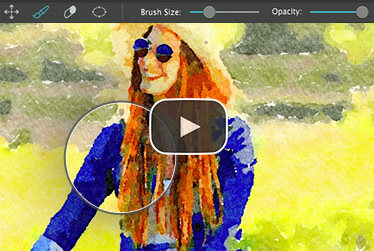 Built on-top of an incredible rendering system that uses real-world techniques, this application does the initial work, producing a watercolor instantly, then allows you to customize your paintings using an array of Sliders, Layers, Brushes, Color Washes and Artistic finishes. 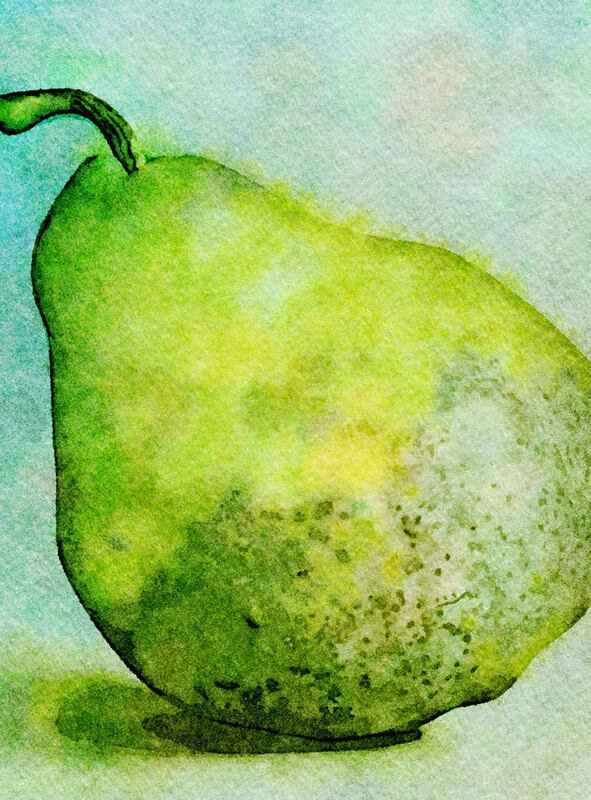 The end result—print quality watercolors filled with transparent luminosity and sheer beauty. 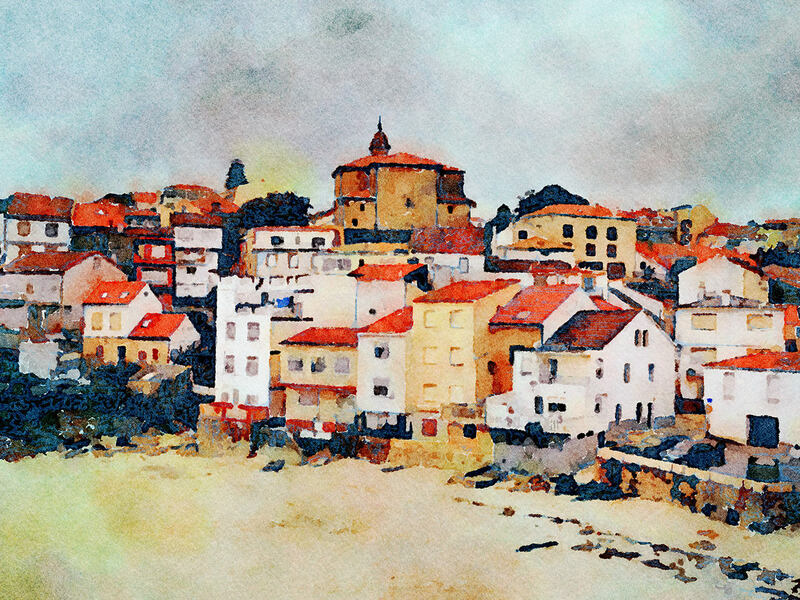 Watercolor Studio uses artificial intelligence and image recognition to render the initial watercolor then gives you the ability to create infinite variations quickly and easily. 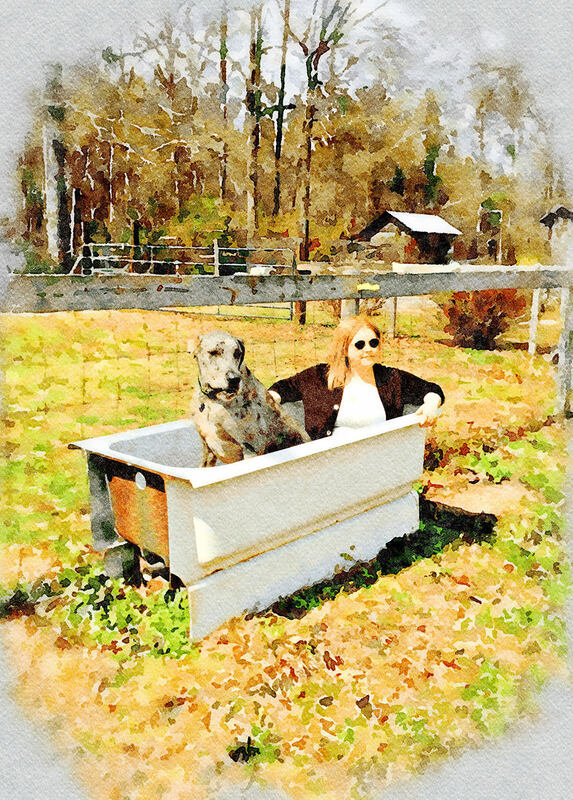 Change paintings into an ink wash, add a beautiful artistic finish, brush in details, and even spatter it with liquid spots. 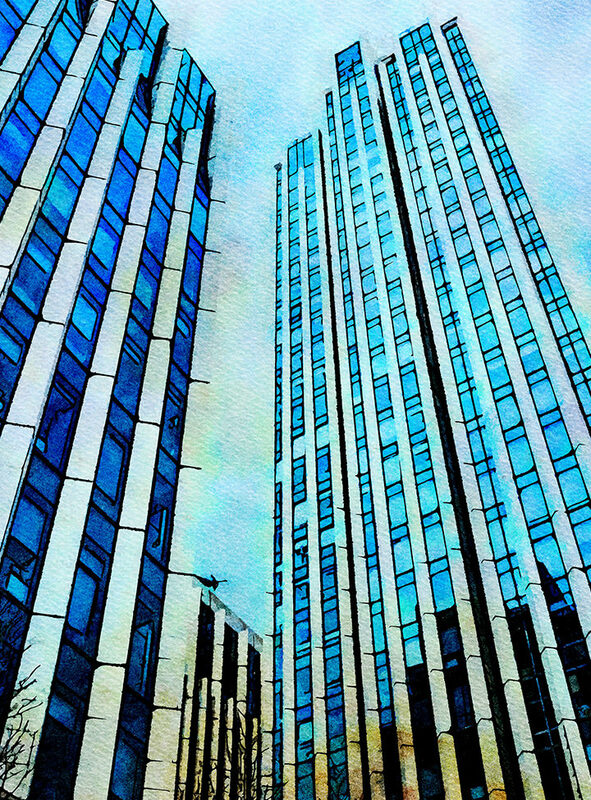 Control everything from details-to-shades-to-negative space-to-coloring. No artistic skill needed! 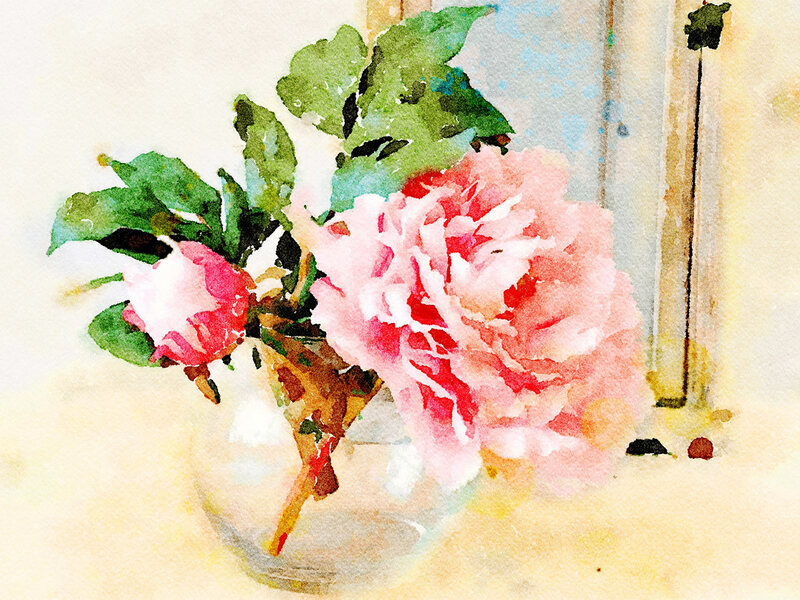 The beauty of a well executed watercolor comes from the transparency of paint on paper. It also comes from the watercolors unique free flowing characteristics. 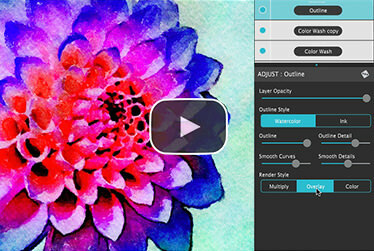 Watercolor Studio makes it easy to do just this with a one-of-a kind Liquid slider. As you move it, watch as color bleeds throughout the painting for an ultra wet style. Or use the Wet Edge slider to define edges with built-up pigment and color that bleeds inward naturally. 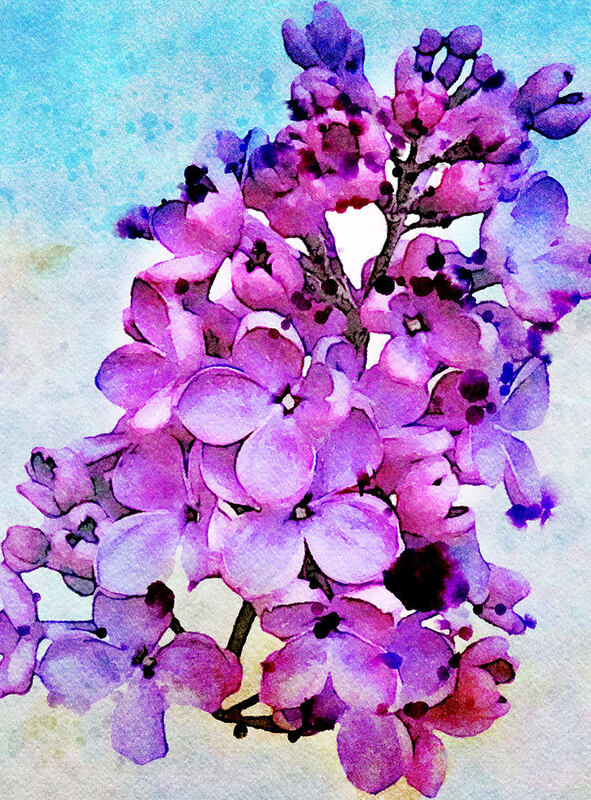 Paint Styles, also known as Paint Layers allows you to create beautiful and unique watercolors by stacking watercolor layers, blending color washes and texture, and brushing in details. No artistic skill needed! 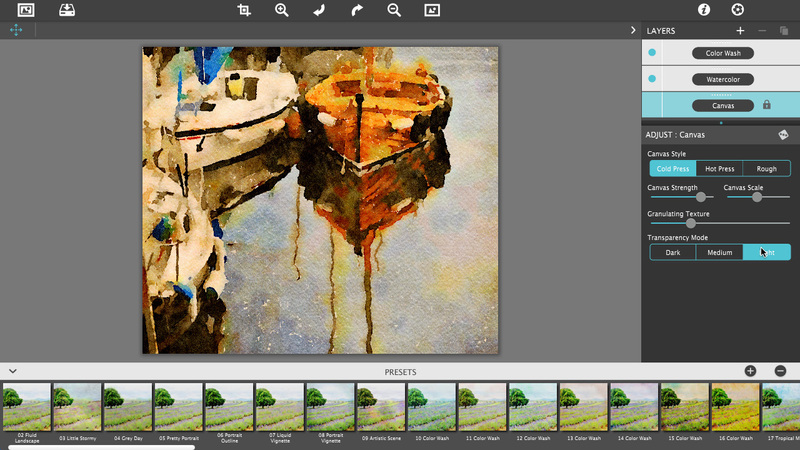 Every photo placed in Watercolor Studio is automatically transformed into a watercolor with full control over settings. While it’s great to have complete control over what the paint does on the paper, some of the most beautiful effects occur in the experiment process. So have fun and try not to be too careful. You will be amazed at some of the paintings you will get. 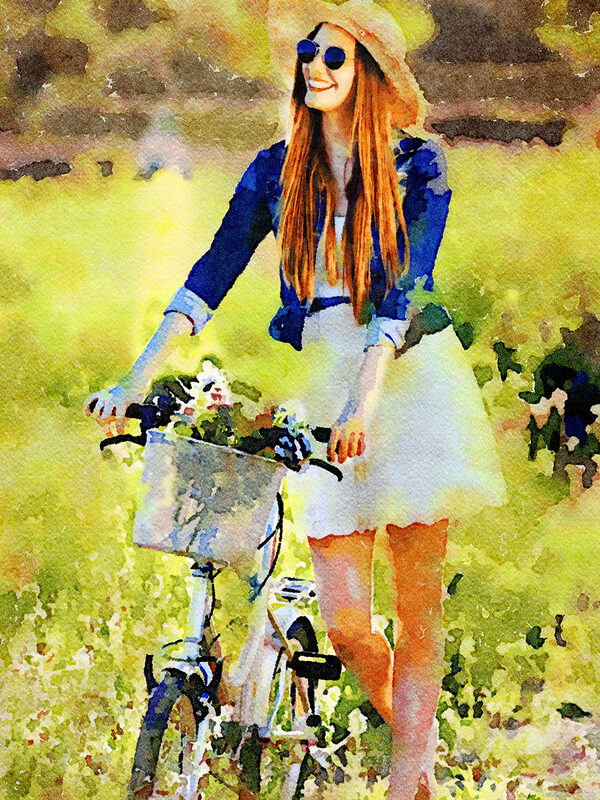 Watercolor—Portrait is a wet-on-dry painting with all the characteristics of a true watercolor. Fine-tune portrait detail and shades, then smooth color using the liquid slider while keeping contours clear and color defined. 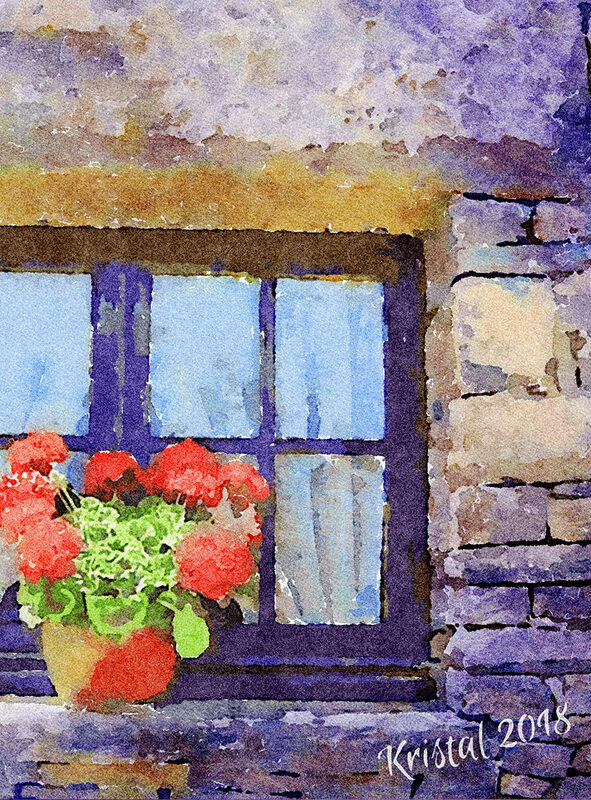 Watercolor—Landscape is an abstract free flowing wet-in-wet paint style, great for landscapes. Use it to spread indiscriminate details as if saturated with water for a loose wet watercolor painting with color that bleeds together. 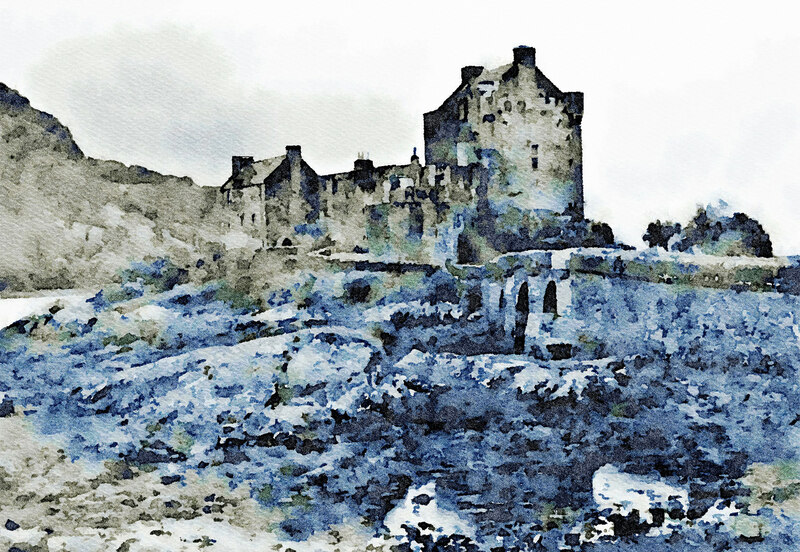 Ink Wash renders photos into soft subtle paintings, consisting of one-to-three colors. 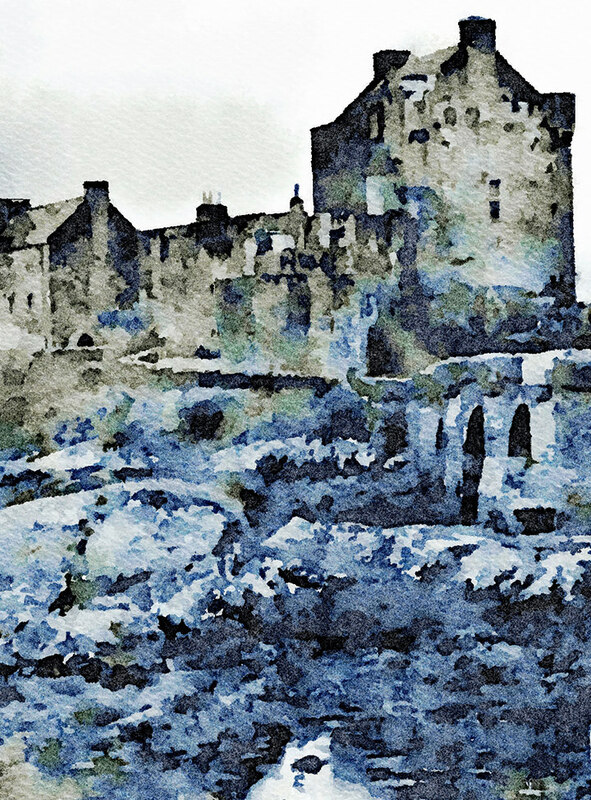 Choose from a library of washes to create ultra inky paintings or light monotone ones. 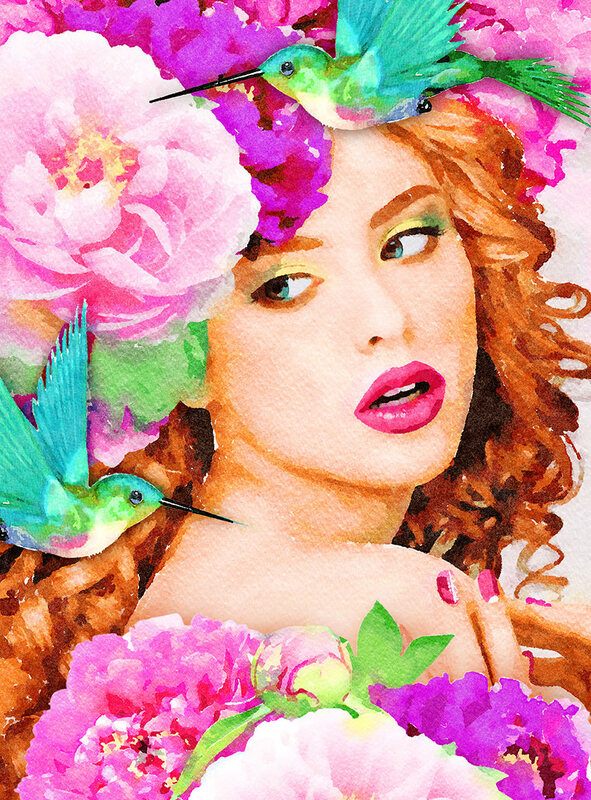 Combine with Color Washes and Outline Layers for an expressive piece filled with artistic character. 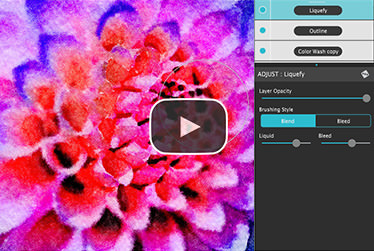 Liquefy is a transparent layer used to dilute and bleed color. Use the Liquefy Layer above one or more layers then brush with a continuous motion to blend areas where needed. This subtle effect smooths areas like a true paint brush dipped in water. 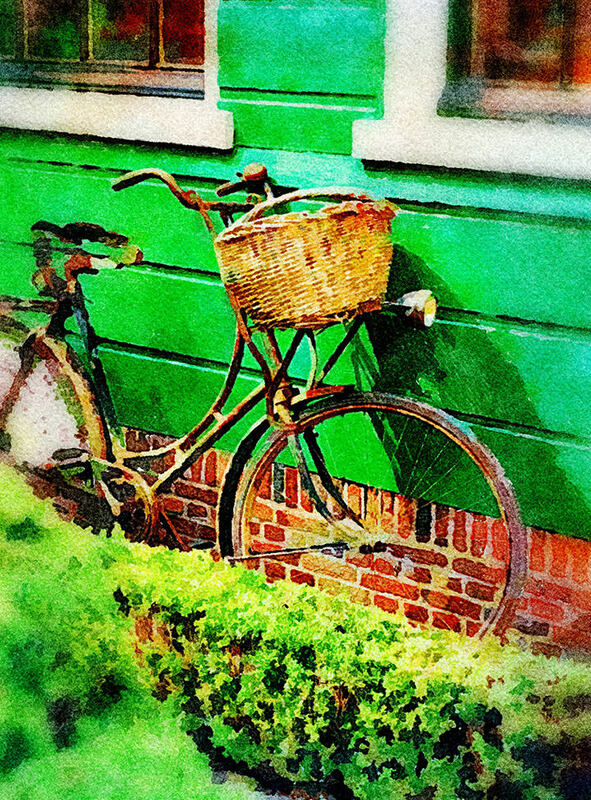 Color Wash blends handmade color washes and textures into the painting while retaining some or all of the original color. Use them to warm up, cool down or to dapple light and color throughout the painting with control over how much. 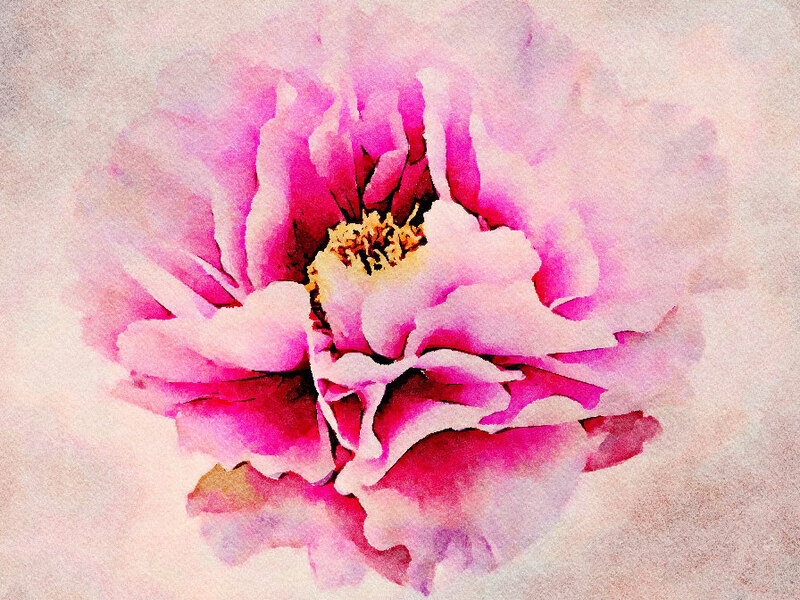 Use render modes to combine washes with Watercolor, Ink Wash and Outline Layers for breathtaking one-of-a-kind art pieces. Outline defines edges throughout the image. Choose between round fluid watercolor strokes or sharp inked in ones. 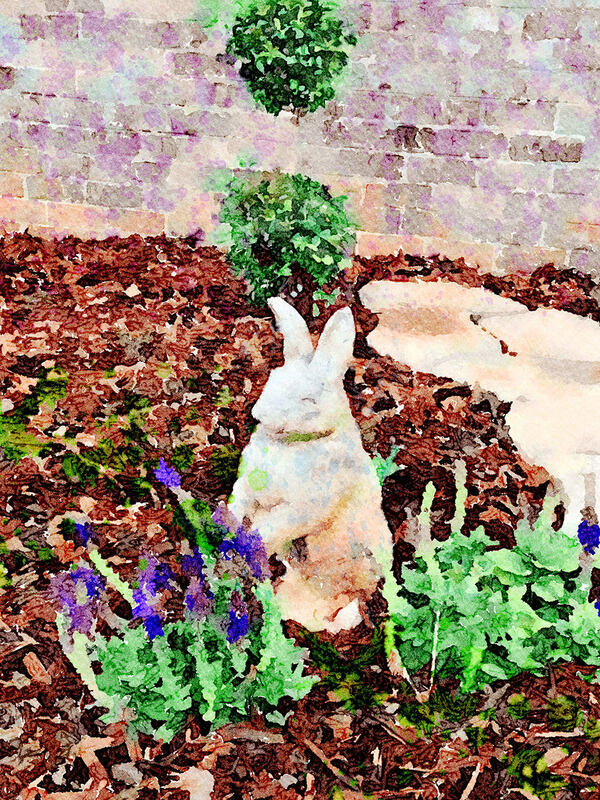 Additional modes allows you blend the outlines into the painting naturally or create solid ones that stand out. Spatter adds liquid spots that actually looks wet and runny. 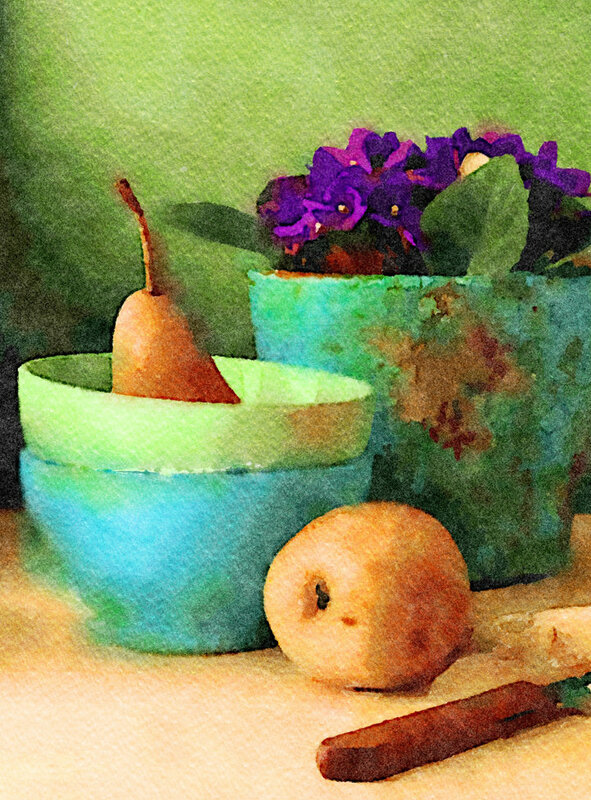 Use them to add texture, age, and bits of color throughout the painting. Canvas is the base of your painting. 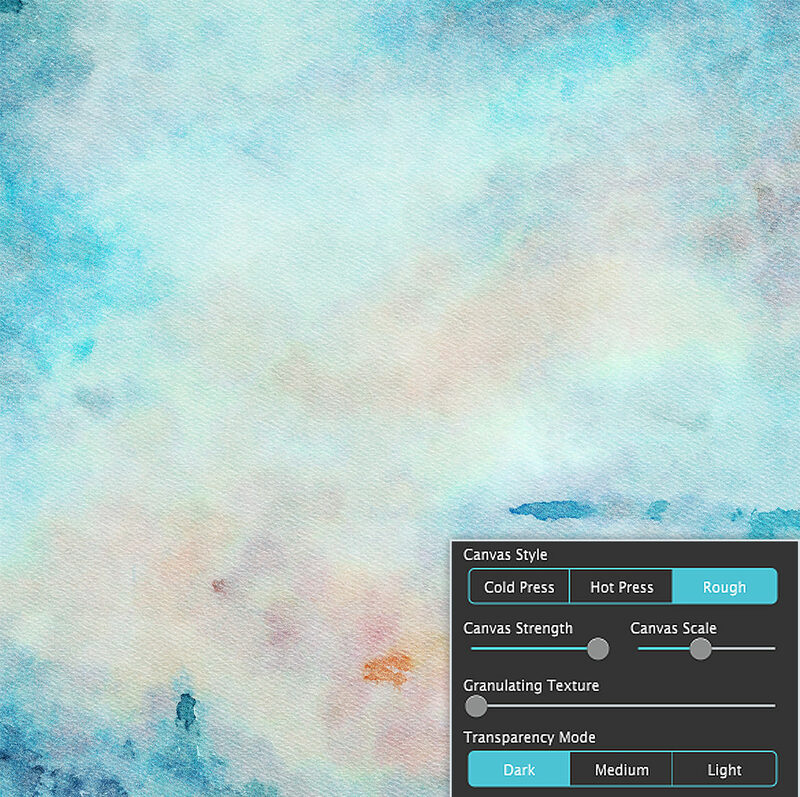 On this layer use settings to change the canvas style (paper). Choose between cold press, hot press or rough. Here you can also increase the pigment granulation in the watercolor and how dark or light the transparency of the color appears on the paper. 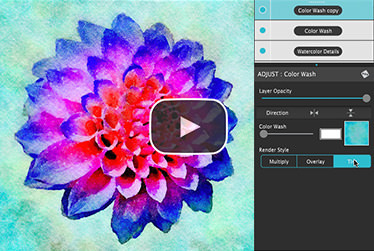 Check out what’s new in Watecolor Studio painting software for Mac, Windows and iPad. 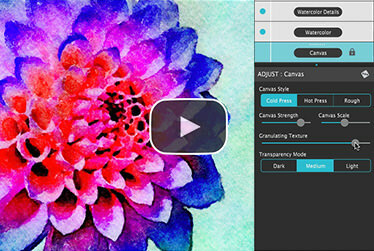 This is our biggest update to Watercolor Studio yet. 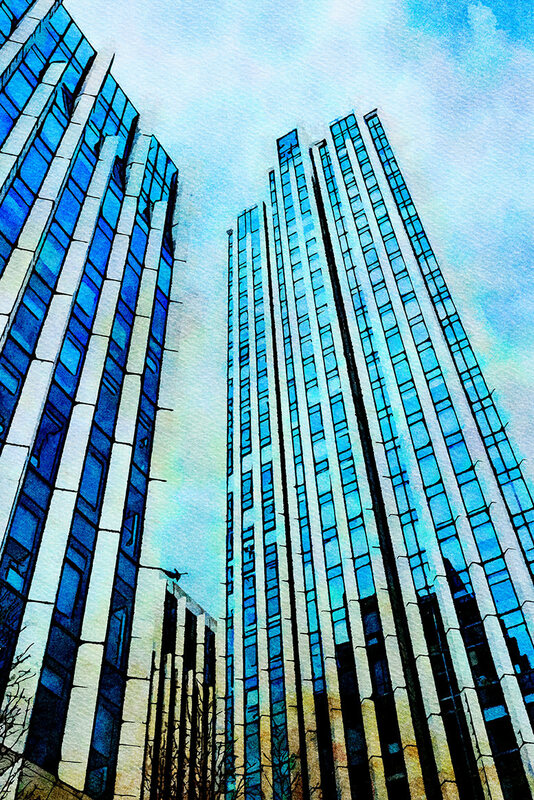 Our rendering engine was re-written from the ground up to gain numberous enhancements! These include: Up to 2X Faster Preview, a Higher Quality Ellipse Tool, a new Edge Bleed and Wet Edge for more variation, new separated Liquid and Edge Bleed for better control, all New Presets that have more variation and styles, and new Preset Categories to better organize your creations. You are also going to notice improvements to the Outline, Negative Space and Edge Styles. All have been rewritten to for better contouring and smarter blending with paint and canvas. 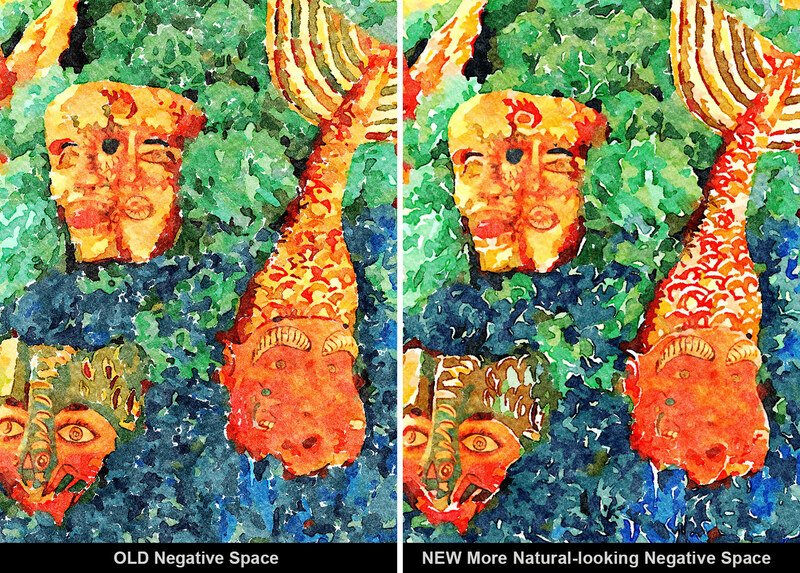 Edge Bleed blends the color regions by bleeding and blending out detail. The higher the value the more the edges will bleed into other colors. This works hand-in-hand with the Liquid slider by allowing wet paint to bleed into more areas. Wet Edge style controls how the pigment spreads to the edges of each color region. A new Wet Edge menu presents three edge styles: Sharp is well defined and is typically associated with the paint drying before another color is added. Bleed and Soft keeps pigment slightly wet when applying the next color which causes them to bleed into each other. Liquid slider controls the overall wetness of the painting. This works inline with Edge Bleed and will affect areas that bleed into other color regions by spreading the wet ink across colors. Categories and New Presets are included and sorted into tabs along the bottom. A User Presets tab is also there to help keep your work organized and readily available for future projects. 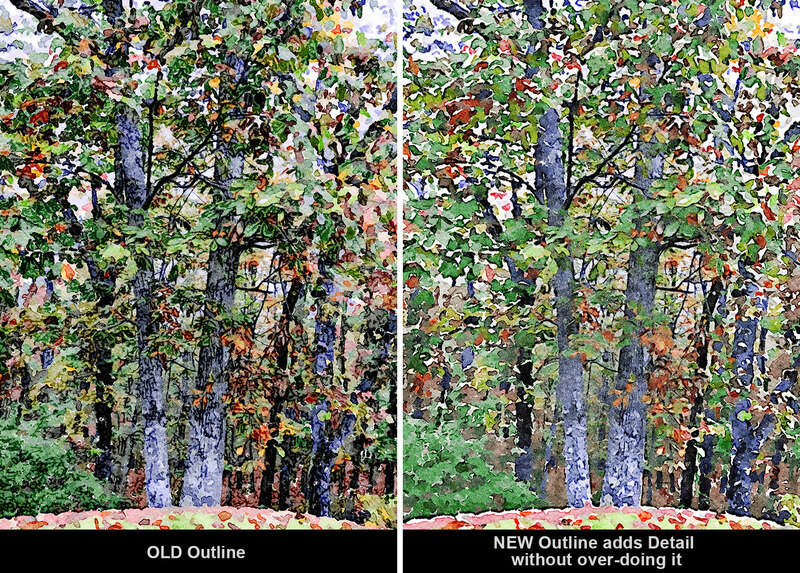 Improved Outlines uses a smarter algorithm to add detail to paintings without over doing it. This new 'smart' feature adds smoother contoured lines to places where it makes sense to have them. More Natural-looking Negative Spaces. The negative space is the white area where the paint doesn't go onto the canvas. The new improved outline follows contours in a more natural way. 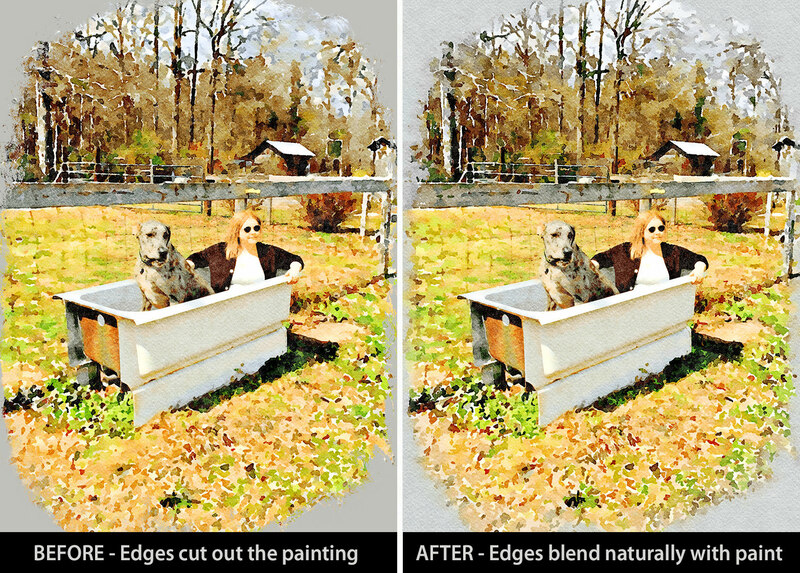 Improved Edges bleeds the image into the paint for a natural painterly quality. Edges Take On Layer Styles. 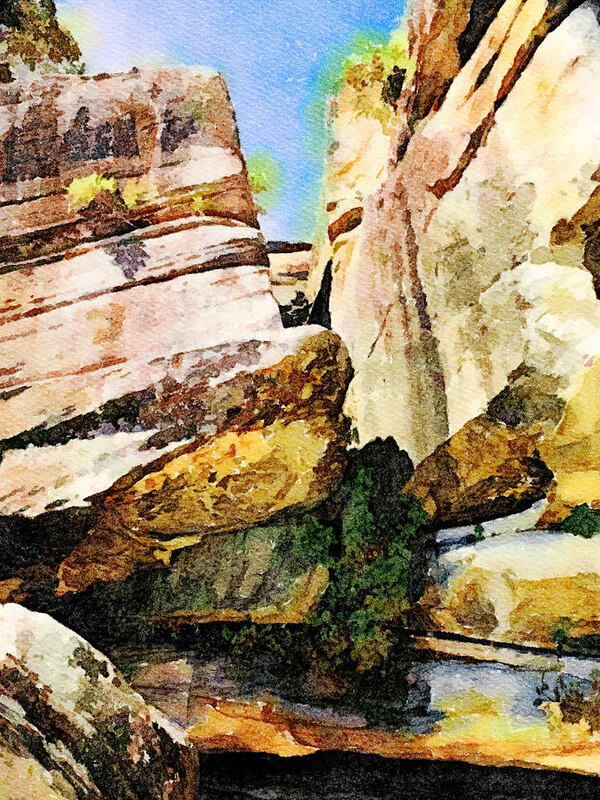 Color Washes can go beyond the edge and onto the canvas, and Liquid Vignettes can be used to soften taped and artistic edges. Last Upgrade we added 3 new features. The first is a New Signature Layer to hand sign your painting declaring it officially done! 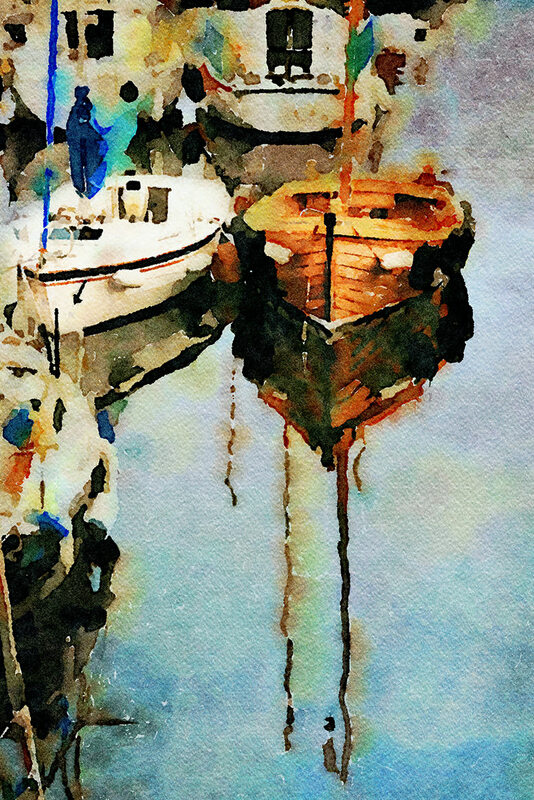 There is also a New Liquid Vignette Layer that bleeds watery paint from the center outwards, and a New Pigment Layer for a beautiful overall texture effect. 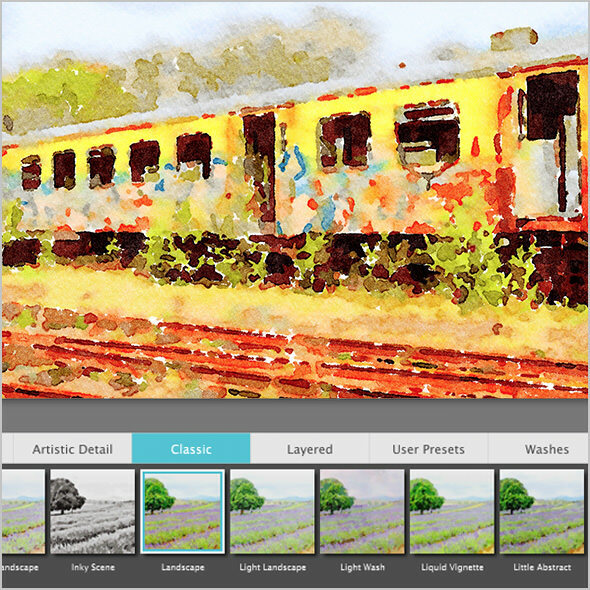 Signature Layer personalizes your painting using two signature styles: The first uses a type face from the fonts installed on your computer, and the other allows you to paint on your signature freehand. 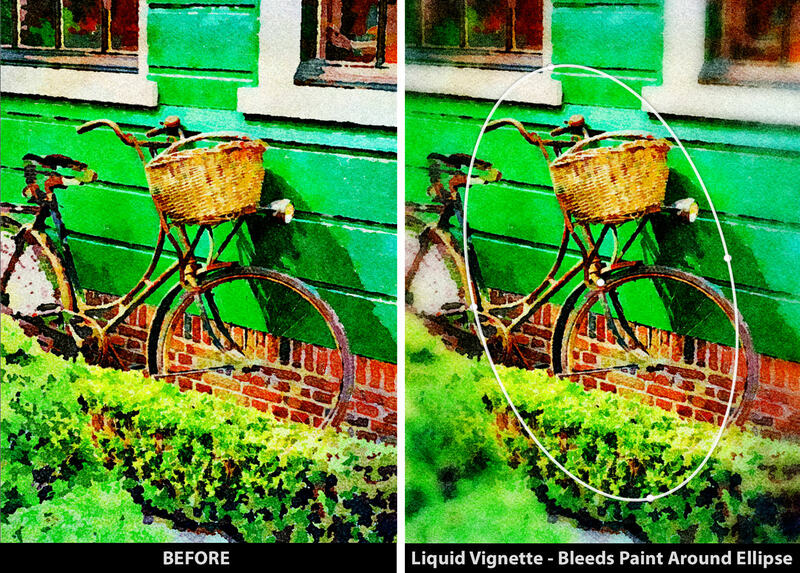 Liquid Vignette Layer creates a focal point by bleeding and blending out detail with our one-of-a-kind ellipse tool. 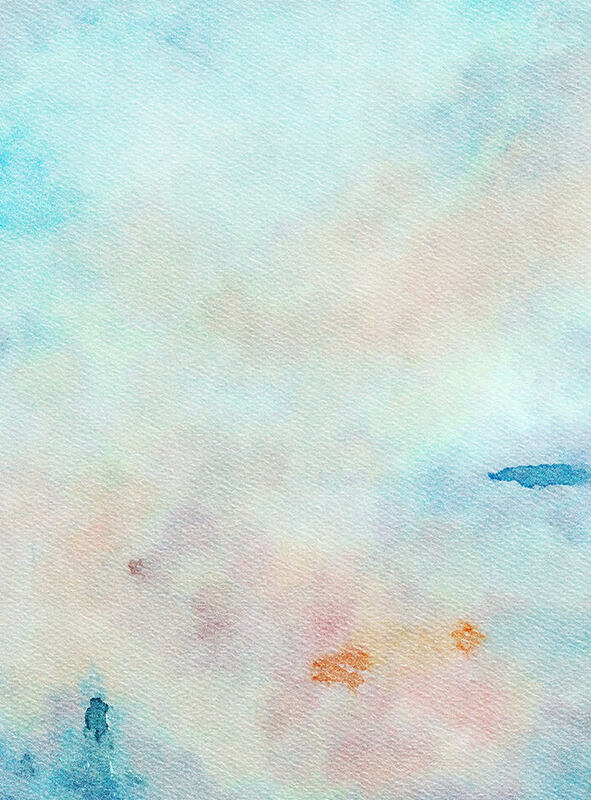 When an ellipse is placed on a watercolor paint liquifies in a smooth gradual transition around the circle and out to the edges. Use one ellipse for a watery vignette, or several for focus on multiple areas. 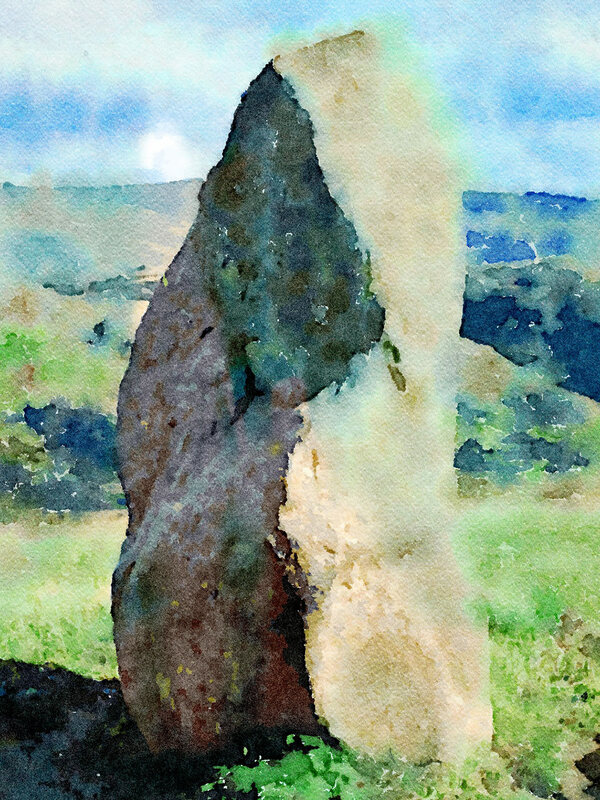 Pigment Layer adds a granulated pigment texture to the watercolor. Granulation is the effect you get when the pigment particles clump together rather than them settling evenly on a painted surface. 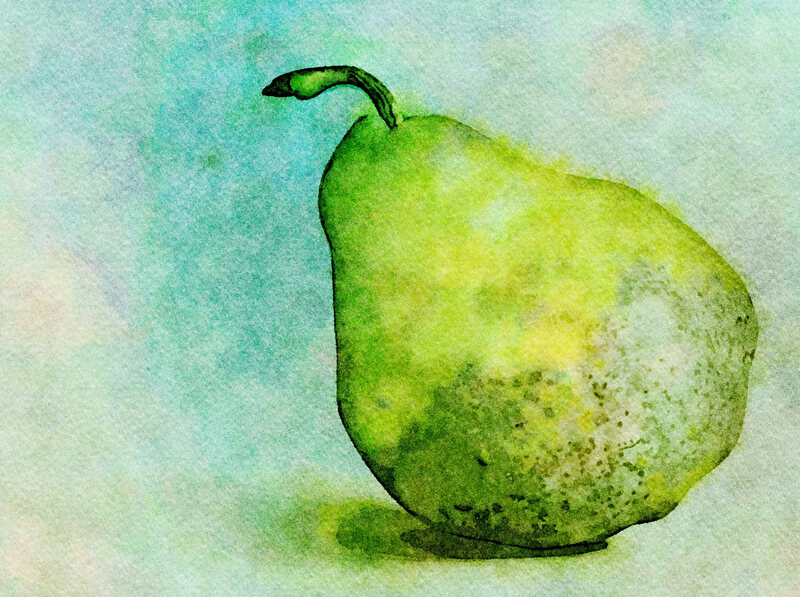 This effect is great for creating additional texture in an otherwise 2D watercolor painting. 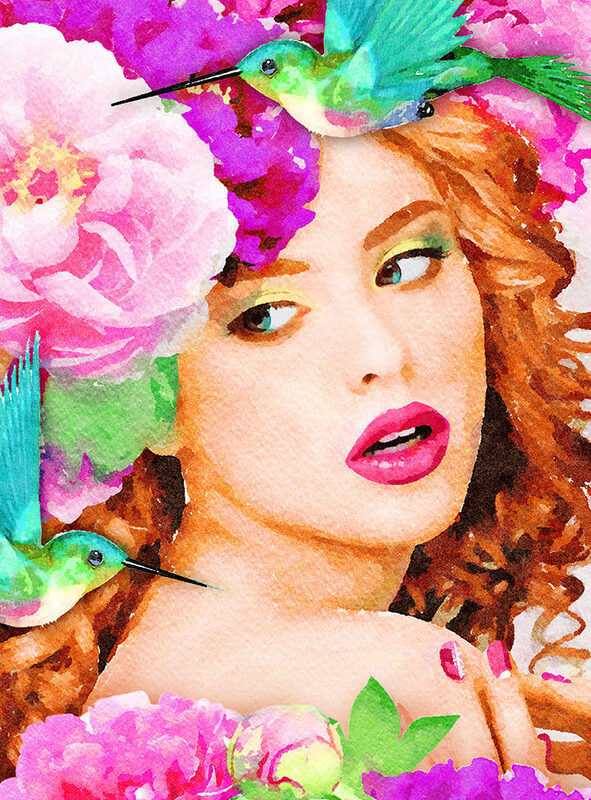 This series of six videos will show you how to blend watercolor layers, stack washes, add an outline layer, adjust canvas settings and brushing with liquefy. This video gets you started! 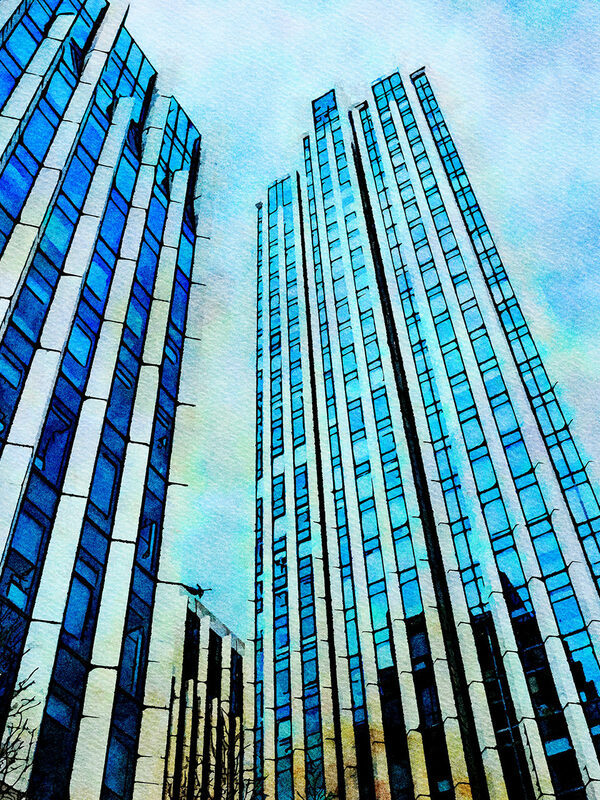 Fine-tune the default landscape settings, add subtle detail by blending portrait and landscape layers, and modify the overall color scheme using an artistic finish. Kick the painting up a notch with Color Washes. 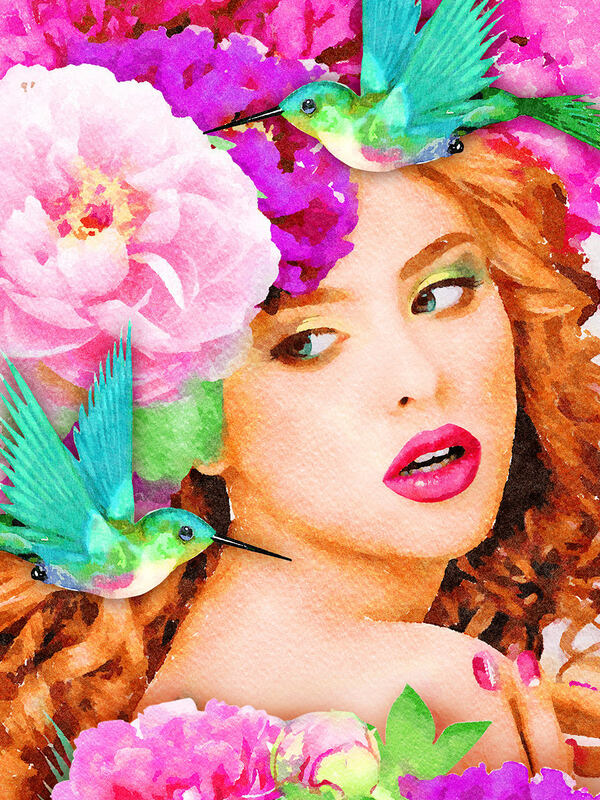 This video shows you how to stack two washes, brush off color, and change render style to create a beautiful customized background. 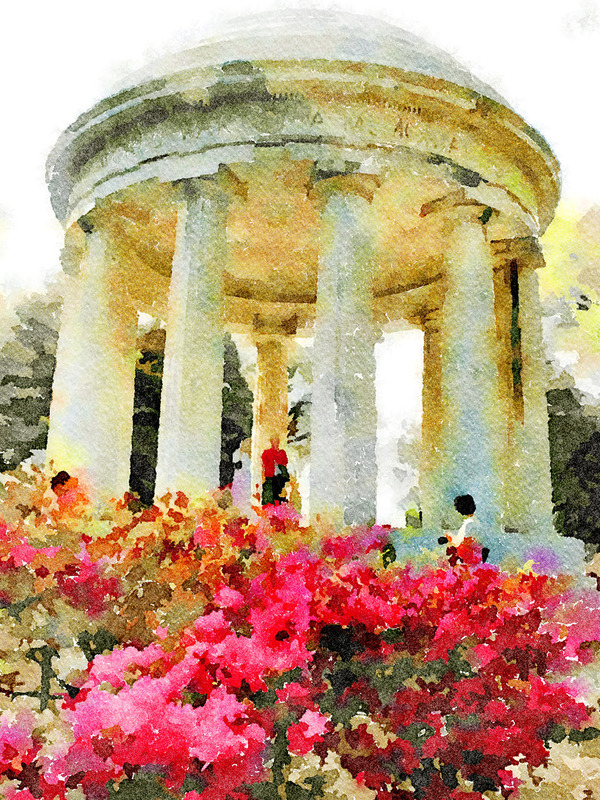 Create a touch of emphasis throughout the painting. 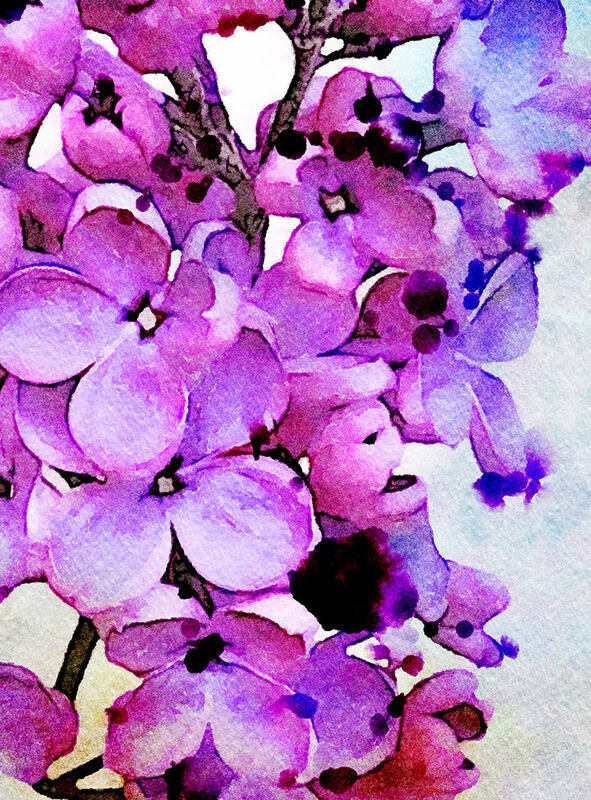 Choose between watercolor and ink outlines, or use color as another way to add defined pigment along the edges. Increase paper texture and scale. Use this layer to change the canvas paper style. 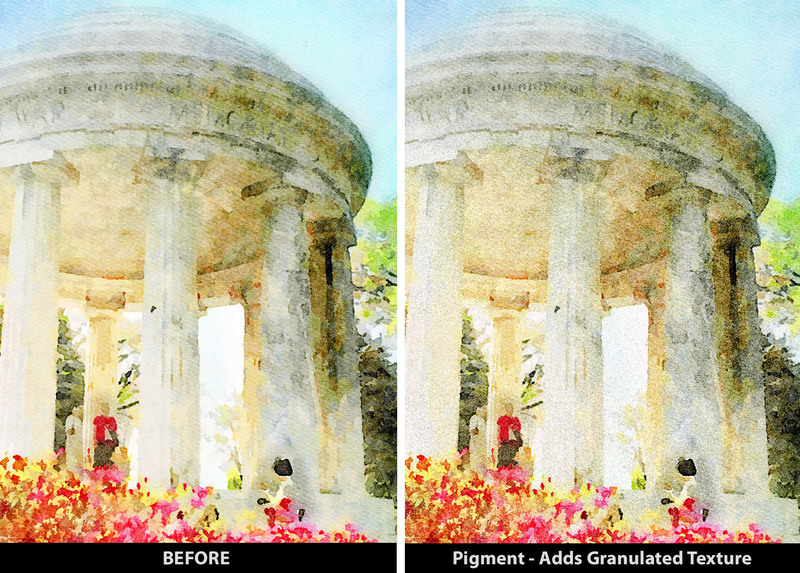 Here you can also increase the granulating texture (pigment) and adjust the overall transparency of the watercolor. 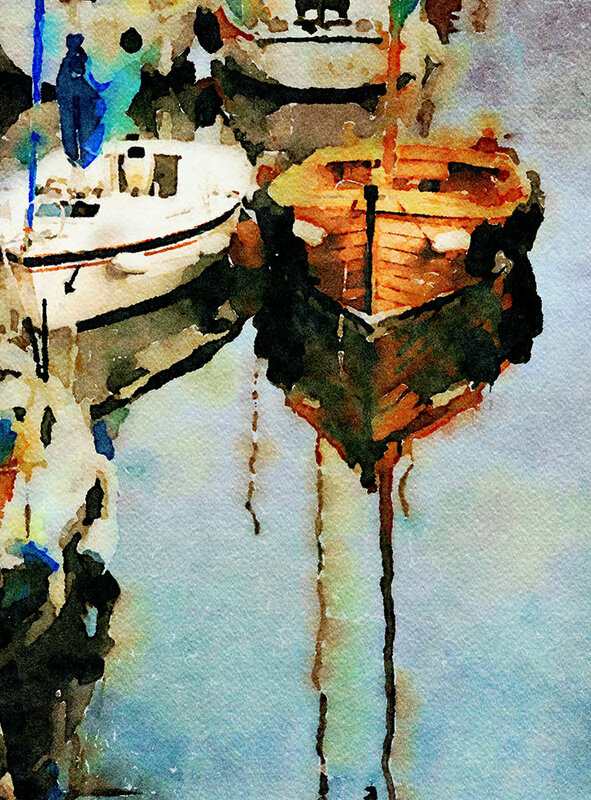 Add a Liquefy layer to blend, wash out or de-focus areas in the painting. 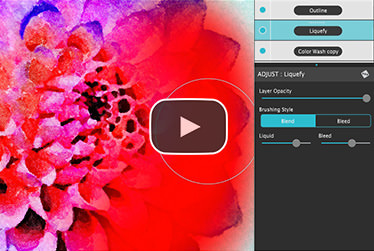 This video demonstrates how to brush on Liquefy and the affects it has on layers below. This video explains Liquefy’s layer hierarchy. When Liquefy is the top layer brush changes occur instantly. When Liquefy is under another layer(s) brush areas turn red and changes render when the brush lets up. 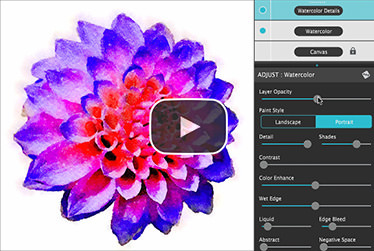 Take your watercolor paintings to the next level. 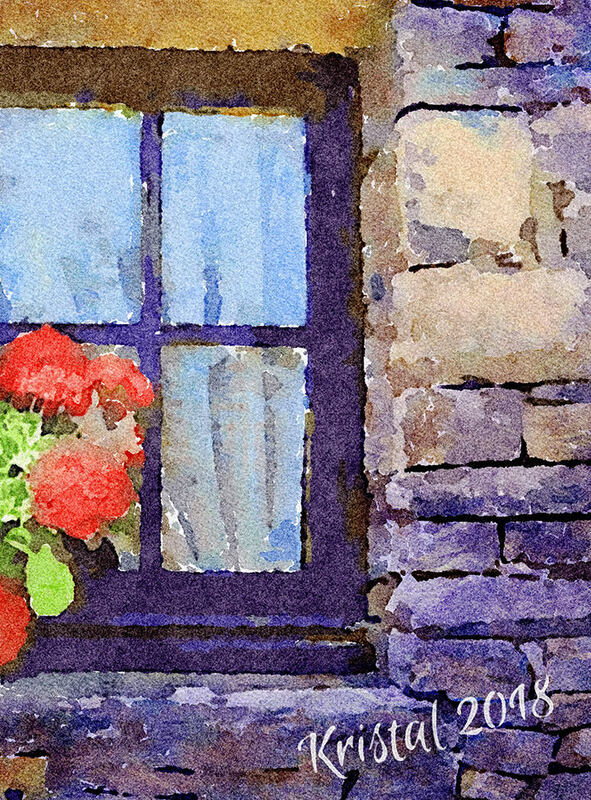 This series of short videos will demonstrate how easy it is to add detail to paintings. 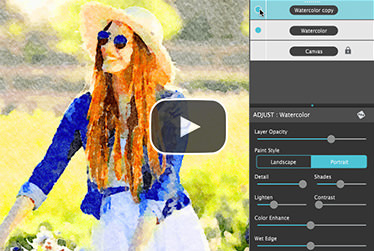 In this video learn how to blend a detailed Portrait layer with a loose Landscape one. 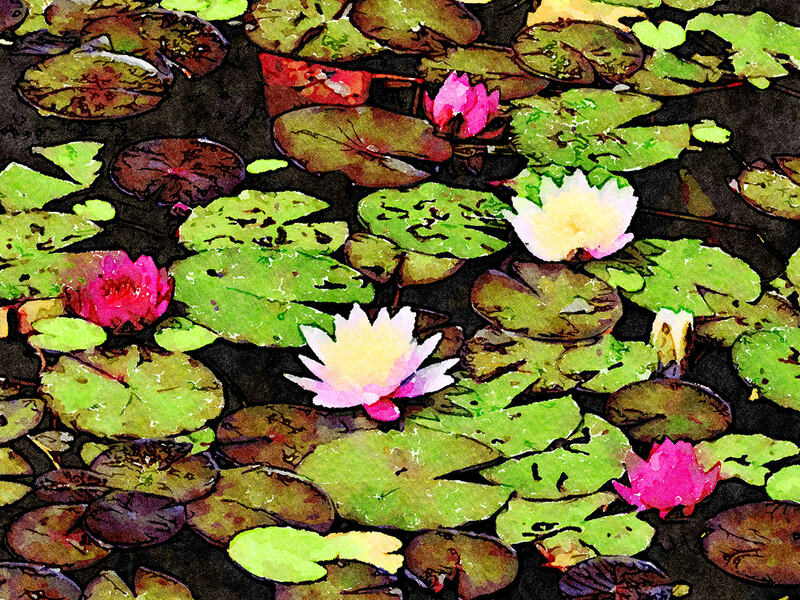 The result is a perfectly balanced free flowing watercolor with a touch of detail. 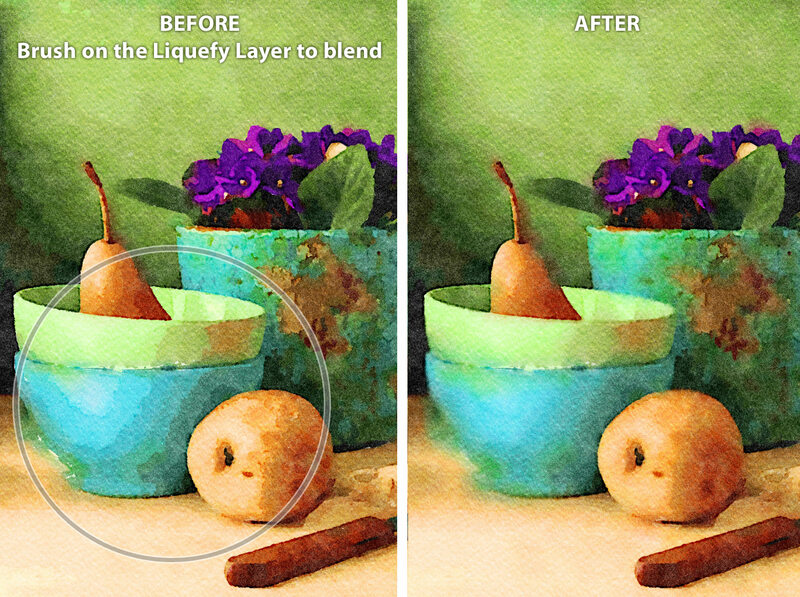 Using the mask feature, learn how to brush-in portrait details with full control over settings. All with the ability to turn on-and-off details or even delete them, with out effecting the painting. 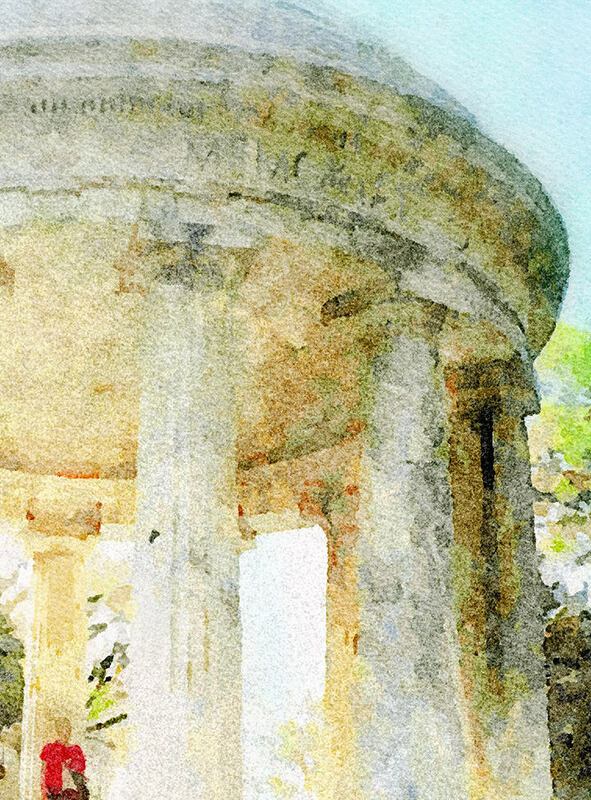 Add a touch of detail to your watercolor using our one-of-a-kind detail ellipse. 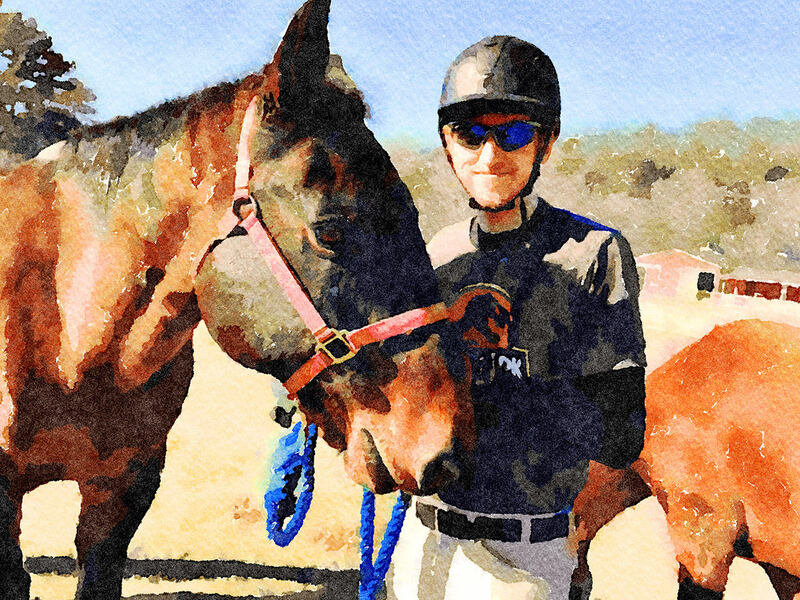 Place one on an abstract watercolor for extra definition, or add one (or several) to a portrait for enhanced detail on a face and/or hands. 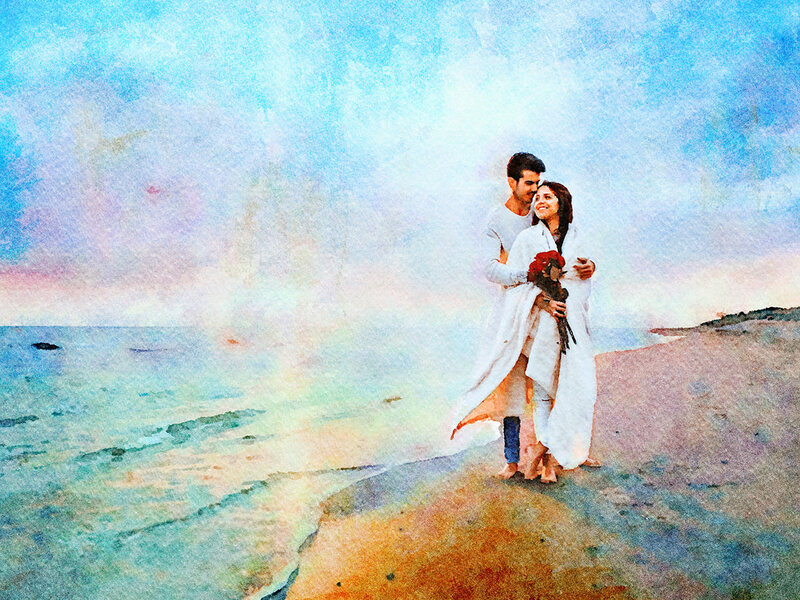 Watercolor features a series of wetness sliders: Wet Edge, Liquid and Edge Bleed all designed to give the painting a natural look. Choose between Landscape settings for a wet free flowing painting, or Portrait for a painting with controlled color and detail. Ink Wash creates a limited palette using the power of shades then allows users to build up color, and movement, using a library of washes. Color Wash applies semi-transparent handmade washes and stains to paintings. Use one or stack up several for a customized blend of color and texture. 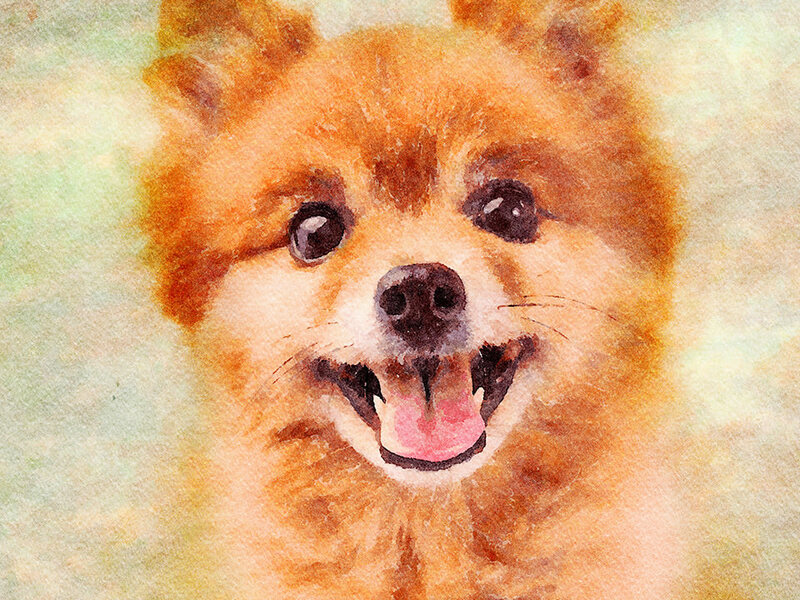 Liquefy is a transparent layer, you brush on, to blend and bleed areas in the watercolor. Move it around, turn it on or off, or delete it to start over—it’s easy to use and very forgiving. Splatter applies water spots to the watercolor. Choose between multi-color, single or no color. Options bleed the edges of spots and a placement box lets you move splatter around and resize them. Outline defines edges throughout the image. Choose between round fluid watercolor strokes or sharp inky ones. Canvas is the base of your painting. Use this layer to change the canvas style. Choose between cold press, hot press or rough paper texture. A powerful wetness algorithm with full control. Decide how wet the edges become or how much the color spreads. Smart layers with options to reorder, duplicate and delete. 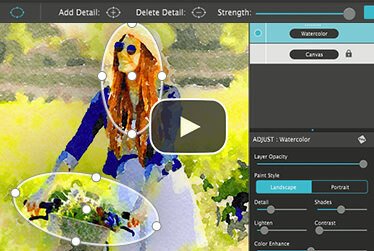 This powerful feature allows you to stack and blend watercolor layers, washes and spatter for one-of-a-kind artwork. 70 Artistic Finishes adjusts the color scheme to warm or cool bias, and modifies the intensity of color creating unity and altered moods that blends seamlessly. Save Layer Preset allows one or more layers to be saved for future use. You know it's a layer present when an icon appears on the corner of the preset thumbnail. Includes a plugin which allows quick access to Impresso Pro from inside Photoshop CS5+, Elements, Lightroom and PaintShop Pro for Mac and Win. Supports actions, transparency, blending, last filter command, batch processing and 16bit RGB/Greyscale modes. Contact us any time we are committed to your long term satisfaction! 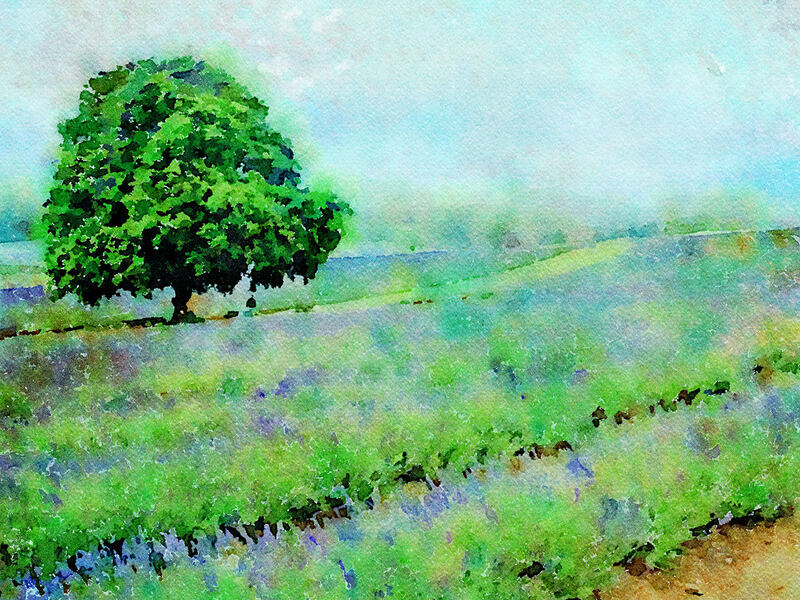 Watercolor Studio—Automated photo-to-watercolor software with full control over detail, shading, color, outline and finishes. Created for photographers and artists of all skill levels!